In our Society Is it Possible to Experience Equality and Justice? In this research article, we will defend the following thesis: that insofar as our finite society is conditioned by linear time expressing the relationship of inequality, contradiction and violent conflict among beings, unity, equality and justice are impossible, or, if you prefer, approximate, apparent, or incomplete. We may then conclude that harmony and justice are possible or complete if, and only if, we, the humans free ourselves from linear time, which is the source of all contradictions. What is the origin of linear time? Our assumption is that linear time is the product of our brain, which perceives, through its finite individual senses, the multiplicity of the world as succession and conflict and devoid of unity. Real and definite solution to the problem of inequality and violence in society, however, may be achieved if we radically transform our finite individual senses into infinite universal senses that are capable of perceiving the unity of our infinitely diverse and fragmented world. How can we accomplish such an astonishing feat? The answer lies in elevating our finite brain from the biological level, where it is a collection of low-frequency nerve cells that operate on a positive time scale, to the quantum level, where it is an assembly of high-frequency fundamental particles that operate on a zero time scale. We contend that in the deepest recesses of its physical reality, our actually finite brain becomes an infinite brain in possession of infinite universal senses that perceive the multiplicity of the world simultaneously as a harmonious whole. Only an actually infinite brain can access the cosmic end (τέλος) and supreme good of human society, which is unity, equality, justice, and free energy ensuring the continuity of our life and motion within the infinite universe. Only a mind which is different from that one which created our problems can solve them. As long as we are finite beings conditioned by linear time, we are programmed to cease our life and motion: that is, to die. We die by aging, illness, or violent conflict. If we die by violent conflict, by killing ourselves or the others, there can be no supreme good; no ethical act of unity, equality, and justice; and no continuity of our life and motion in space-time. For the Kantian skeptics the supreme good, – which we assimilate here with unity, equality, and justice ensuring the continuity of our life and motion – though an impossible thing, has a regulative power that controls our problems – that is, our contradictions, conflicts, inequalities and errors that result injustice – without solving them. This regulative power, however, we contend is a delusion in the face of the impossibility of obtaining a real solution to our problems and the necessity of, in fact, maintaining our problems as insoluble. Indeed, insofar as each solution may remedy a problem, the violent conflict, for example – and not the cause of the problem, which is Euclidean time, it is inevitable that each solution will generate a new problem, a new conflict, such that in our time-conditioned society, the cause and the number of unsolved conflicts remain constant, despite progress in our society. Moving indefinitely from conflict to conflict, our ever-changing society is not only unable to propose any lasting solution to the problem of conflict; worse, it is unable even to attempt a solution. The reason is that our finite society, conditioned by time, must generate violent conflicts and die. It follows, then, that the solution of the problems of conflict, inequality and injustice is complete and real if, and only if it is entirely different and independent of their cause, which is linear time. Otherwise, any solution remaining within the program of linear time is illusory and, inexorably, leads our time-conditioned society to collapse. Let us present the above argument in terms of the ancient Greek problem of motion from a to b of the Euclidean unit distance ab . In this case i) a designates the observable state of minimum justice- a state characterized by maximum injustice, which we assimilate with unregulated injustice – and that we call the problem ; ii) b designates the ideal and real state of maximum justice- state characterized by minimum injustice – which we call the solution; and iii) an designates our finite time-conditioned society indefinitely progressing toward the solution b and characterized by the observable state of incomplete, apparent or false justice, which we assimilate with regulated injustice . In relative and apparent terms, any recession of an from a necessarily involves an increase of justice in proportion to its distance from a. In absolute and real terms, however, we do not have any increase of justice. Indeed, no matter how close to the ideal state b is the approaching an, an must be always, through its finite variable n, at an infinite distance from b, for the analytic principle of inequality and linear time such as an < b to be unambiguously satisfied and the analytic and time-conditioned foundation of our progressing finite society to be unambiguously conserved . Ultimately, our progressing society an, having as it does an incomplete, apparent justice or a regulated injustice, is as far off from its solution b as is the first hierarchical society having a minimum justice or an unregulated injustice a, which is a maximum injustice. This means that not only is our progressing society an incapable of reaching its final state of maximum justice b, which is true justice; even worse, it is incapable of moving beyond its initial state of minimum justice a. Progression from a to b on the Euclidean unit distance ab is therefore impossible because our advancing finite society an can neither reach a definitive solution of its problem nor even attempt any solution whatsoever! In fact, because each solution generates a new problem, our society an “moves” tautologically from problem to problem without being able to break the problem barrier an and effectively move to the solution b. Ultimately, because our finite society an is constrained by the arrow of Euclidean time, it must eventually exhaust its limited free energy through its indefinitely regressing problems and die. Taking into consideration these reflections, we contend the following: Any increase of justice through the external transformation of our institutions is an illusion insofar as we do not free our society from Euclidean time – the source of all conflicts, contradictions, errors, inequalities, and injustices in our observable world. Our fundamental assumption here is that Euclidean time is not an essential principle of our real physical world but instead an accidental principle of our analytic, conflicting mode of perceiving the physical world. The origin of Euclidean time is perceptual. Indeed, we assume that our finite brain at rest is a collection of nerve cells (retinal cells) at ground-frequency that perceives only a finite part of light. This finite observable part of light travels forward through empty space at the unique, constant and finite speed c, which is the product of the finite frequency f and the finite wavelength λ and which we take as a finite unit: c = f x λ = 1. Communication at the finite speed of light is a retarded communication that generates a time-delay between any two spatial points a and b, and a loss of information during the communication process. For example, the retarded communication creates a time-delay between here and out there – between our finite brain here, which we designate by a, and the distant object out there, which we designate by b, such that our finite brain a perceives the distant object b as being either before or after itself and hence either as it was in the past or will be in the future and not as it is now. We call observable or sensible object the object observed as it was in the past or will be in the future, and real physical object the thinkable (intelligible) but unobservable object as it is in itself now. 1. either b < a or a < b. Now, the temporal order between a and b caused by the finite observable speed of light obliges us to epistemologically divide the object, universe or world into conflicting parts – into the i) observable (sensible, phenomenal, apparent) world, which we designate by an and assimilate, because of its dependence on our time-conditioned finite brain, with our finite brain a such as an = a and the ii) real, physical world or physical whole independent of our finite brain, which we designate by b. 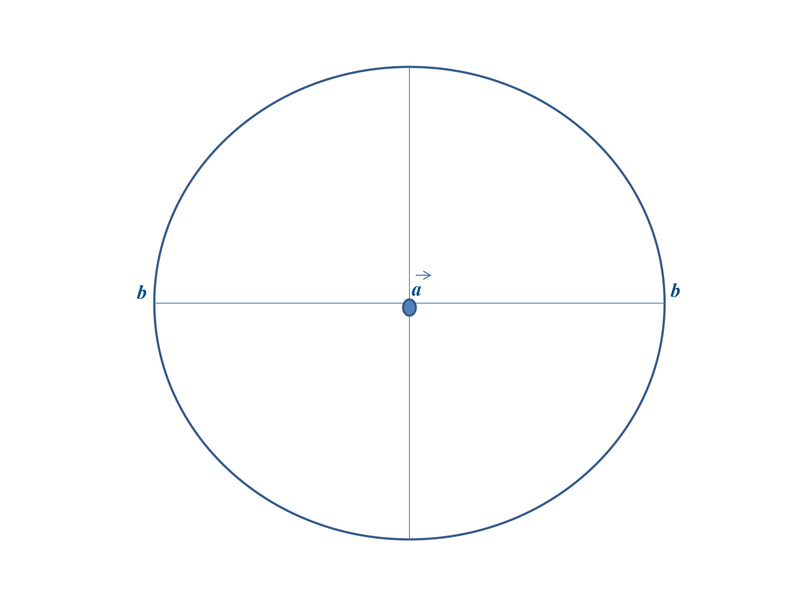 In turn, we define the real, physical world b as the sum total of its infinite number of parts, and we locate it on the limiting boundary b of a unit sphere of center a and radius ab. On the other hand we define the observable world a as the finite observable part of the real, physical whole produced by the selective influence of our finite brain on the real world – for example on the real physical light. We locate this observable world a at the center a. Fig. 1, below, is a one-dimensional sphere representing in two-dimensional space the real physical whole. The observable world a is apprehended by our brain’s faculty of finite individual sensibility, which is the faculty of sensing an arbitrarily selected (focalized) part of the real physical world to which we assign the forward sense (arrow) of linear time. The physical world b is apprehended by our brain’s faculty of infinite universal reason (infinite nous, intelligence, mind), which is the faculty of thinking of the physical world in itself as an infinite physical whole, independently of our finite sensibility, and free of linear time. Therefore, we assimilate the real physical world with Plato’s eternal intellectual (ideal) world, or with Kant’s noumenal world, to which our infinite mind has immediately access. This mental direct access to the physical world happens because the physical world possesses the property of self-containment, that is, of self-replication, and thus is both a containing whole and a contained part, both outside our finite brain as a containing infinite whole and deeply inside the matter of our finite brain as a contained infinite mind. This means that our infinite mind does not represent the real physical world; rather it is the physical world because it replicates the physical world . ­In fact, seen from a maximally or infinitely distant observer, our infinite mind is the physical world. Thus the physical world is the external objective manifestation of our infinite mind, and the infinite mind is the internal subjective manifestation of the physical world. This explains why laws produced by our infinite mind are valid for the real physical world and vice versa: Our infinite mind and the real physical world are equivalent despite their different aspects and spatial inner /outer positions with respect to our brain. in which b designates the information and free energy content of the real physical world, and a designates the information and free energy content of our finite brain’s observable world . The above inequality states that the information and free energy content of the physical world b – defined as the sum total of an infinite number of parts – is greater than the information and free energy content of our observable world a – defined as the partial sum of a finite number of parts – and that the observer-independent physical world b is chronologically, ontologically and epistemologically prior to the observer-dependent observable world a, which is an inexact representation of the real physical world. As a matter of fact, the positive time-difference b –a > 0 measures the error, entropy, or loss of information and free energy that the process of inexact representation and delayed (not-instantaneous) communication involves. If b designates the state of complete and true justice that characterizes the perfect (complete) society replicating the timeless physical world, and an designates the state of incomplete justice that characterizes our indefinitely progressing society and its corresponding time-conditioned observable world, we obtain then the positive time difference b – an > 0 that measures the loss of (true) justice from which our progressing society suffers. This loss of justice is infinitely small in relative and apparent terms and infinite in absolute and real terms. Thus, when we experience the real physical world with our finite brain, we lose the information and free energy of the physical world in agreement with the second law of thermodynamics, which is the thermodynamic expression of Euclidean time. The loss of information, free energy and justice produces in turn violent conflict in our finite society’s observable world. Per contra, when we do not experience the physical world, there is no loss of its information, free energy and justice and hence no production of violent conflict. One of the questions we will attempt to answer in this paper is how to experience the physical world without generating Euclidean time regarded as the source of loss of information, free energy and justice. If linear time is order according to succession, and if succession is impossible coexistence and simultaneity, then beings that cannot coexist and be simultaneous in space are necessarily contradictories existing successively in time. Therefore, linear time expresses the contradiction, incompatibility, and violent conflict among beings. For example, we saw that our finite brain, which detects uniquely the finite observable speed of light, perceives the different parts a and b, as contradictory opposites that cannot coexist in space and hence exist successively in time in conformity with the analytic principle of inequality and linear temporal order – namely either as a < b or as b < a , either as progressive linear time (involving an increase of information and free energy content in the world) or as regressive linear time (involving a decrease of information and free energy content in the world). Because inequality and linear time generate the hierarchical order of comparison and subordination between opposites, where one of the opposites prevails over the other to cause the state of imbalance and injustice – namely the state of monarchia – hierarchical linear time is necessarily the source of injustice in our time-conditioned society. Now, the kind of space in which inequality and injustice occur is Euclidean. Indeed, different points a ≠ b on the Euclidean line E do not coincide because they are unequal. 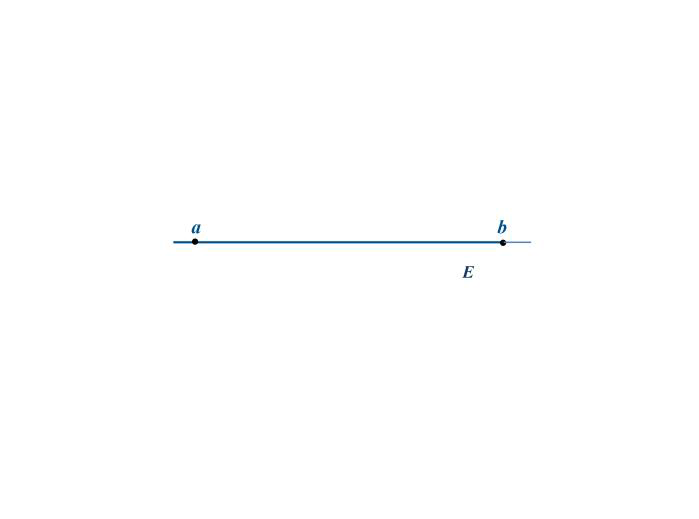 They are unequal a < b because they are at unequal distance from the same common point a.
in which -> is a sign of implication signifying “therefore”. The formula 3 shows us that the analytic principle of inequality and linear temporal order expressed through the above asymmetric order is a Euclidean principle that rules any two points a, b on the Euclidean line E.
where (′) is the sign of negation or impossibility. The above formula expresses the reduction of the difference between any two points a,b into an impossible unity, which we call contradiction. It verifies the analytic principle of contradiction, which stipulates that nothing is both a and b. In fact, no sense organ can tell us that a thing possesses simultaneously opposite determinations a and b . Similarly, if the points a,b correspond to things, then the analytic principle of contradiction states that the unity, simultaneity or coexistence of opposite things is an impossibility. Thus, what the analytic principle of contradiction -regarded as an abstraction of the finite sense organ- does, essentially, is to reduce the opposition or difference between any two points a,b into a contradiction, that is to say into an impossible coexistence, unity and harmony. in which + is the sign of disjunction signifying either/or. Finally, if the original definition of Divine Logos is the Heraclitean unity of opposites, then by prohibiting this unity of opposites the analytic principle of contradiction essentially denies Logos and affirms the A-logon, which is the impossible unity, equality, and coexistence of opposites. This impossible coexistence of opposites means the impossibility to form a harmonious real community of beings that immediately communicate, and therefore the necessity of having a succession of isolated beings – the individuals – deprived of unity harmony and immediate communication, and which the mathematicians call collection or aggregate, which they assimilate with the arithmetic continuum. This aggregate, constrained by linear time and verifying analytic principles of organization, is in a chaotic state of violent conflict and injustice, which in our observable world appears regulated, whereas in reality, it is, as we have shown, unregulated! It has now become clear to us that to experience unity, equality, and justice in our society, we must change not our external institutions but instead our neural perception of things, which is finite, analytic, and generates Euclidean time. In fact, we have argued that our finite brain at rest is a collection of nerve cells at ground-frequency that function in a finite manner and perceive uniquely a finite part of light’s real speed. This finite observable speed c =1 reduces the difference and distance between any two points a, b of space into a relationship of contradiction and succession that defines linear time and rules our observable world. If our neural perception of things operating on a positive time scale 0 < t (where positive time t is any time greater than 0=10-19s) reduces the natural spatial relation between coexisting points into an artificial constraining time relation between contradictory points, then how can we perceive the world itself – the real physical world – free of perceptual reduction and corruption  ? Can we perceive without effecting on the world a net change, which we interpret, depending upon the case, as loss of information, free energy and justice ? Our answer is yes, in conformity with the Gnostic tradition of the first rationalist philosophers – the Indo-Iranians, the Greek Ionians, the Pythagorean philosophers – of humanity ranging from1500 to 500 years BCE . In the world of knowledge the idea of good appears last of all, and is seen with an effort; and, when seen, is also inferred to be the universal author of all things beautiful and right, parent of light and of the lord of light in this visible world, and the immediate source of reason and truth in the intellectual. We have argued that if our brain perceives through its nerve cells at ground frequency, it is finite and analytic and generates a time-delay and conflict between any two spatial points a and b, for example between hereand there, between our finite brain here and the distant object out there; or, to put it another way, between our society’s observable world of minimum justice and the real physical world of maximum justice. As a finite brain composed of nerve cells vibrating at ground frequency, we tautologically move from finite experience to finite experience generating Euclidean time and violent conflict without being able to break the barrier of finite experience and effectively move beyond. Thus, we cannot obtain an infinite experience that will enable us to perceive the unitary physical wholeness of our infinitely fragmented world (agnostic conclusion of the Kantian type). However, if we change the definition of our brain and say instead that it is composed of smallest or zero volume particles, called fundamental particles (singularities) that possess infinite frequency and energy and operate on zero time scale t =0 (where time is equal to 0 =10-19s), then our brain indeed has the power to perceive the world completely and spherically – that is, as an infinite physical whole . This spherical perception, which we call infinite universal perception or absolute perception, is independent of the sense organ and hence of the nerve cell. In fact, absolute perception is grounded in these smallest particles or singularities, which are not nerve cells of particular sensation but rather singularity cellsof universal sensation. Because the physical world taken as an infinite whole is self-replicated in every singularity, each singularity contains the physical world’s infinite totality of information and free energy. The brain which knows how to extract this infinite information and energy stored in the smallest unit volume, we call infinite brain endowed with the power of spherical perception. For example, an infinite brain extracting information and energy from its singularities would have the power to experience directly the real speed of light, taken as an infinite unit and defined as the complex product of infinite and zero speeds, or as the complex product of infinite frequency and zero wavelength: c = fλ = ∞ x 0 = 1 . Absolute perception is true and unerring because it is free of the constraining influence of the finite perceiver over the real object. and have the same information and free energy content. This means that the real physical world is the same before and after perception, that absolute perception does not produce any net change on the physical world, such as reducing it into an observable world possessing less information, free energy and justice. Absolute perception is therefore unerring perception free of corruption – free of the second law of thermodynamics generated by our neural perception of things. 7. aa = ab → a = b. The limiting boundary b, which partially encloses the open Euclidean line E in order to transform it into the radius of a sphere, is a limiting point of zero radius and infinite curvature. Cosmologists call this a singularity. The singularity is not only the geometric point that unifies any two distant points a, b, and which is manifested logically and physically as the synthetic equivalence principle, but is also the smallest particle in which the infinite totality of information and free energy of the physical world is stored and out of which everything is composed. 8. ab = a / b = 1. If we negate both opposite determinations a and b, we obtain the synthetic principle of the included third, according to which everything is an impartial and indeterminate whole a′b′ that possess neither the determination a nor the determination b. If all equivalent points of a sphere are complex indeterminate wholes possessing simultaneously all determinations and no determination, then ultimately the sphere is a complex, indeterminate whole composed of complex indeterminate wholes. This is not a Russellian paradox according to which the “whole of wholes which are not members of themselves” is both a member of itself and not a member of itself, but instead a coincidence or unity of opposites that reveals the complex nature of the sphere taken as the geometric figure of the real physical whole. The self-referring and self-penetrating sphere belongs to the second-order logic, which far from being paradoxical is the real Logos of the physical world – the physical Logos (ὁ φusikός λόγoς) – whose nature (physis) is synthetic and infinite. The transformation of our individual neural perception of the physical world into a universal perception that reconciles our finite brain with our infinite mind, or to put it differently, our brain’s finite perception with our mind’s infinite reason, will ultimately enable us to experience the real physical world in its unified wholeness free of contradiction, inequality, and injustice. It will enable us to experience our indefinitely accelerating and violent society an = a deprived of unity and justice as a complete constant and harmonious society b endowed, with unity, equality and maximum justice similar to the real physical universe. It will finally enable us to experience the real community of beings connected logically and physically by the synthetic equivalence principle and geometrically by the limiting point – the singularity – comprising everything (if taken as a unifying whole and principle) and comprised in everything (if taken as a fundamental, smallest particle). We will then definitively call this real and cosmic community of beings Kosmia Polis (Kosmopolis) or, better, to use Plato’s own term, Kallipolis (beautiful city), the unified, harmonious and just society replicating the Kosmos, for what else is beauty (Kallos) than proportion, equality, and the unity of opposites, which Plato identifies with Intelligence, Love, and Justice and which he considers as society’s supreme good. …anything which is coming into being is incomplete, and is in progress toward its principle. 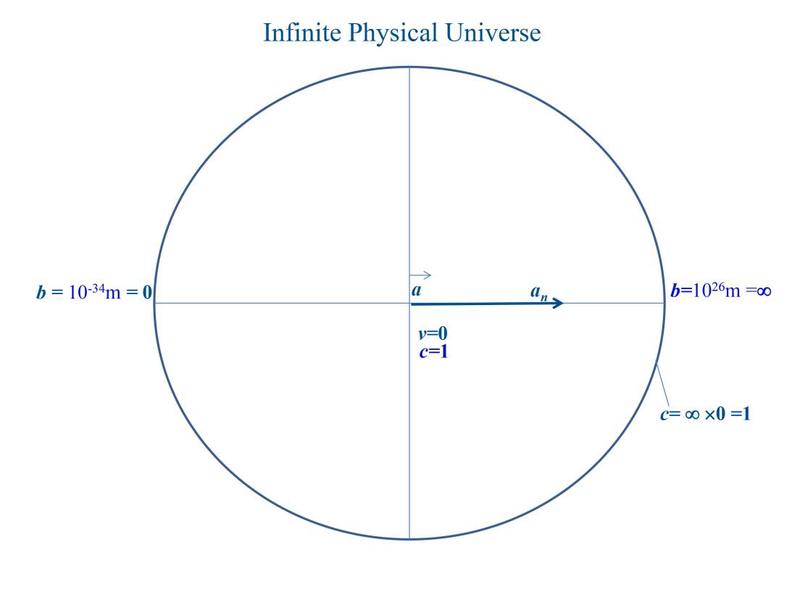 In relative terms, we are at the fixed center a of the real physical universe, represented one-dimensionally by the infinite sphere whose radius r is of infinite size and its limiting boundary b is of zero size and infinite curvature. At the center a, our society appears finite and time-conditioned and has the lowest level of being characterized by minimum speed, minimum free energy, information, and justice. The finite society is composed of finite observers with finite brains. The finite brain at rest is a collection of nerve cells at ground frequency that operate on a positive time scale t > 0 (where positive time is any time greater than 0=10-19s) and detect a finite part of light’s real speed, which is the finite unit speed c=1. This finite speed of light in turn, generates a time-delay between any two maximally different and distant points of space a, b that transforms their relationship of coexistence into one of succession, contradiction, and violent conflict in agreement with analytic principles of organization. The succession of points constitutes an aggregate whose chaotic multiplicity of points lacks unity and communication, and each point is an isolated individual perceived from a unique angle at one time and from different angles at different times. Thus, the finite brain perceives the limiting boundary b of the eternal, infinite, physical universe having the highest level of being as if it were the ultimate past or the ultimate future of the center (here and now) a, whereas in reality b is simultaneous with a. The timeless physical universe is reduced by our finite perception of things into the time-conditioned observable universe whose limiting boundary b exists either before or after the center (here and now) a in conformity to the analytic principle of inequality and time order (see the evolutionary big-bang theory of the universe). The observable universe is the galaxy an, which under the eccentric force of repulsion (or expansion) accelerates away from the center a and toward the limiting boundary b. Indeed, the speed of its acceleration v is proportional to the galaxy’s radial distance d from the finite observer at the center a in conformity with the Hubble law v =kd, where k is the Hubble constant of proportionality roughly equal to 3×104 m/s/1022m or 30km/s/106light years  . Because our finite society is constrained by linear time – the source of all contradictions – it is an akosmia polis devoid of its supreme good and contradicting the infinite and timeless Kosmos – that is to say, the real, physical universe. Similar to the accelerating galaxy an, our finite society and finite brain accelerate away from the center a(here, now), which is the state of lowest being (the problem), and orient themselves toward the limiting boundary b of the infinite physical universe, which is the state of highest being characterized by the realization of the supreme good (the solution). The state of lowest being has minimum speed, minimum free energy, information, equality and justice, whereas the state of highest being has maximum speed, maximum free energy, information, equality, and justice, all of which constitute different determinations of the supreme good possessed by the perfect body: the perpetually living, infinite, physical universe. Progression is the term for this acceleration from the lowest state of being to the highest. The driving force of our progressing society is the desire (love) for the supreme good whose gravitational manifestation is relative to the limiting boundary b the force of attraction pulling our progressing society at the center a toward the limiting boundary b. The same force of attraction is relative to the center a, the force of repulsion pushing our progressing society at a away from a – the topos of minimum justice – and toward the limiting boundary b – the topos of maximum justice. The topos of the supreme good is the physical universe’s self-replicating limiting boundary b existing at a maximum distance from us, outside and inside our finite brain. This limiting boundary b is regarded from the chronological perspective as the ultimate origin or end of the physical universe; from the ontological perspective, it is our finite brain’s fundamental reality and founding principle. The limiting boundary b is also the topos where linear time – the source of all contradictions – is annihilated, bodies move at the real speed of light c=1=∞ x 0, and in a general manner every finite unit quantity of a given kind is an infinite unit reflecting the infinite unit of the real speed of light and defined as the product of infinite and zero quantities, or which is the same, as the product of infinite and zero magnitudes without contradiction or paradox (see Figure 4). The center a is the place where society is finite and time-conditioned and has the state of minimum justice and zero speed. The finite society is composed of finite observers with finite brains that detect through their nerve cells the finite part of light’s real speed, which is the finite unit speed c = f x λ =1. We designate by a, the finite society or brain at rest at the center a, and we designate by an , the finite society or brain, which following the centrifugal movement of the galaxies, indefinitely accelerate away from the center a toward the limiting boundary b. The limiting boundary b is the place where society replicates the infinite and timeless physical universe, and therefore is infinite and timeless and has the state of maximum justice and maximum speed. The infinite society is composed of infinite observers with infinite brains that detect through their singularity cells light’s real speed, which is the infinite unit speed c = f x λ = ∞ x 0 =1. The method for attaining the supreme good is not the indefinite transformation of our institutions: rather, it is, the change of our individual perception, which is neuronal, into a universal perception, which is independent of our nerve cells, and has the divine power to perceive the unity of the many and the diversity of the one. In fact, it is impossible for our indefinitely progressing finite society an to reach the state of supreme good on the limiting boundary b unless we assume that each finite brain of the society is already relative to its fundamental reality – its smallest particles (atoms, singularities) – an infinite brain or mind – a kosmios nous (κόσμιοςnoῦς) endowed with universal perception. The change of the nature of our finite individual perception is accomplished by elevating our finite brain-mind at the center a to the level of its fundamental reality on the limiting boundary b where it becomes an infinite brain-mind thinking and perceiving universally through its fundamental constituents – the smallest particles (atoms, singularities) of zero volume and infinite curvature. As we have already claimed, the self-replicating limiting boundary b of the physical universe is both the boundary of the greatest containing whole (in the macrocosmos) enveloping everything and the boundary of the smallest contained part (in the microcosmos) existing in everything. In other words the limiting boundary b of the physical universe is a common, universal and complex limiting boundary resolved into two limiting boundaries of two different bodies – of the containing whole and the contained part. The infinite brain-mind is the body endowed with a universal (impartial and spherical) perception of things. It perceives the diversity of beings as unity and community and each being of the community of beings as a communicating universe having different determinations simultaneously. But how can our brain’s nerve cells at ground frequency access their smallest constituents – their singularities – and benefit from their highest or infinite frequency, energy and unity in a stable state and in room temperature without undergoing disintegration by fire? When we have the answer, we will have acquired the supreme power of universal perception, that which enables us to perceive the hidden “unity of things lying beneath the surface” (Heraclitus) . We have then attained the state of highest being characterized by the realization of the supreme good in the real community of beings composed of infinite universal “observers”. We called this real community kosmia polis(kosmopolis), because it replicates the Kosmos, or Kallipolis (Plato) – a beautiful, harmonious and perpetually living city free of linear time. For a mathematical and geometric presentation of the problem of motion, see also my recent book Metaphysics of Infinity: The Problem of Motion and the Infinite Brain (Lanham: University Press of America, 2013). in which ≠ designates non-identity or difference and = designates identity, unity, equality, and simultaneity. Different things form both a plurality and a unity, that is to say, a unified plurality, which constitutes a complex whole – a community of things – that obeys the same principle despite their difference, and which we call common, universal principle. (a ≠ b) (b ≠ a) = (a = b). Thus “from the difference harmony arises” as the Ionian Greek philosopher Heraclitus (6th-5th century BCE) remarked 2600 years ago. When different things are equal and harmonious, they obey a common, universal principle and conversely when different things obey a common, universal principle they are equal and harmonious. It follows that the state of justice is also a state governed by a common universal principle. in which the sign → designates therefore; and the sign < designates inequality (less /more), inclusion (contained part/containing whole), implication (if/ then) and succession (before/ after). Taking into consideration the above, we claim that injustice is the interruption of logos or reason and the breakdown of a common, universal principle, which generates the state of anarchy and disharmony. Different things are erroneously perceived as unequal and hence as contradictories generating injustice, whereas in reality and seen from a higher dimension, they are equal and hence coexisting opposites obeying a common, universal principle that generates harmony and justice. The relation of inequality between different things such as an < b states that an is less than b and that b is greater than an. It is also an expression of linear time order, which states that an is before or earlier than band that b is after or later than a. Inequality is an asymmetric relation that interrupts the symmetry and justice between things. The natural philosopher and medical theorist Alcmaeon of Croton (6th -5th century BCE) called monarchia, the inequality between opposites in which one of the opposites predominates over the other generating thereby imbalance and illness. On the other hand he called isonomia, the law of equality, harmony and balance of opposites that generates health (See comments on the medical theories of Alcmaeon in Aristotle’s Metaphysics, traduction J. Tricot, Librairie Philosophique J. Vrin, Paris, 1986, A, 5, 25, Note 4, p 46). See the cosmological and epistemological theories of Ionian Greek (for example Anaxagoras, Melissus, etc), Indian (Hinduist, Buddhist, etc), and Iranian (Zoroastrian) thinkers at the dawn of philosophy and religion from 1500 BCE to 500 BCE. They identify our infinite mind or nous (νοῦς) with the real physical world or universe, which they consider to be an infinite whole. According to infinite (or transfinite) mathematics (see Galileo, Bolzano, Cantor, Dedekind, etc) the property of the infinite whole is self-containment or self-replication: that is, the power to replicate itself within any of its proper parts, for example within our brain, where it becomes an infinite mind. The infinite whole is self-replicated in all scales (see the Pythagoreans, who divided the infinite whole into an infinite number of infinite wholes). The self-replication of the infinite whole implies the equality of the infinite whole with any of its proper parts and distinguishes it from the finite whole, which is unequal to any of its proper parts. There is an immense literature concerning the mathematical and philosophical theory of infinite wholes, which is impossible to cite in this brief article. Nevertheless we cite as a classic reference Cantor’s major work Contributions to the Founding of the Theory of Transfinite Numbers in which he shows that the infinite whole is equal to any of its proper parts. We call error or reductionism the imperceptible selective influence exercised by our finite brain on the real physical world through its finite individual perception of things. This constraining influence reduces the timeless physical world into the time-conditioned observable world containing less information and free energy than the physical world in agreement with the second law of thermodynamics according to which entropy or disorder must increase in the observable world. The world is not the same before and after the brain’s finite particular perception. Before the brain’s finite perception the world is a timeless infinite physical whole designated by b, whereas after the brain’s finite perception the same world is a time-conditioned finite observable part a or an. See Aristotle’s Metaphysics, G, 1010b, 15-30. According to physicists (see Max Tegmark The Importance of Quantum Decoherence in Brain Processes, (arxiv:quant-ph/9907009V2, 10Nov. 1999) neural de-coherence introducing a time-delay between different spatial points a ≠ b appears at a time scale, which is greater than 10-19 s.
 Their proto-rationalist philosophies had a Gnostic basis in the sense that they all believed that the ultimate end (tέλος) of human existence is to attain the level of completeness that the real physical universe has. Because the complete (τό τέλειον) is the eternal and ageless, that which is free of linear time regarded as the source of contradiction and corruption (physical and ethical), it follows that the ultimate end of human existence is freedom from linear time. This, in turn will lead humanity to the state of supreme good, which is unity, equality, justice and free energy ensuring the continuity of our life and motion within the infinite physical universe. See Plato, The Republic, translated by Benjamin Jowett, Kaye Dreams Novel Art, New York, 2009, p 415. If the frequency f of a wave is proportional to its speed v and inversely proportional to its wavelength λ, in conformity with the formula f = v/λ, then the zero volume particles (atoms, singularities) emitting waves of zero wavelength that travel at the finite unit speed of light c =1, necessarily have infinite frequency and energy. If the finite unit speed of light c = 1 has wavelength λ equal to zero, then in function of the formula f = c/λ its frequency f is infinite or highest. If the frequency f is infinite and the wavelength λ is zero, then according to the formula c = fλ, the real speed of light is not the finite unit c = 1, but the infinite unit c = fλ= ∞ x 0 = 1. See Aristotle, Physics, translated by Robin Waterfield, Oxford University Press, Oxford, 1996, VIII.7, 261a13. See Heidmann Jean Extragalactic Adventure : Our Strange Universe, Cambridge University Press, Cambridge, London, 1982, p62. See Kirk, Raven § Schofield, The Presocratic Philosophers, Cambridge University Press, Cambridge, 1988, Chapter : Heraclitus, p192. Aristote, La Metaphysique, traduction par J. Tricot, Librairie Philosophique J. Vrin, Paris, 1986. Aristotle, Physics, translated by Robin Waterfield, Oxford University Press, Oxford, 1996. Cantor George, Contributions to the Founding of the Theory of Transfinite Numbers, Dover Publlications, New York, 1968. Kant I. Critique of Pure Reason, Everyman’s Library, London, 1991. Kirk G., Raven J., Schofield M. The Presocratic Philosophers, Cambridge University Press, Cambridge, 1988. Plato, The Republic, translated by Benjamin Jowett, Kaye Dreams Novel Art, New York, 2009. Heidmann Jean, Extragalactic Adventure : Our Strange Universe, Cambridge University Press, Cambridge,1982. George Allen § Unwin LTD, London, 1971. Ion Soteropoulos is an independent research philosopher and scientific metaphysician who is passionately devoted to creative and transdisciplinary work. 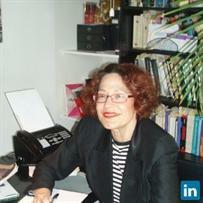 In 2002 she founded Apeiron Centre, the first philosophical organization in the world that studies the idea of infinity in dynamic connection with the finite as presented in our physical universe, society and physical body.